Author MJ House from Royal Oak, Michigan, wrote Don’t Get Divorced! to help you save your marriage before it hits the final breaking point. He hopes his book will be able to save at least one family from the hardship of divorce. With a variety of ways to purchase Don’t Get Divorced! based on your purchasing and read preferences, it’s easy to get the information you need to keep your relationship from falling apart. 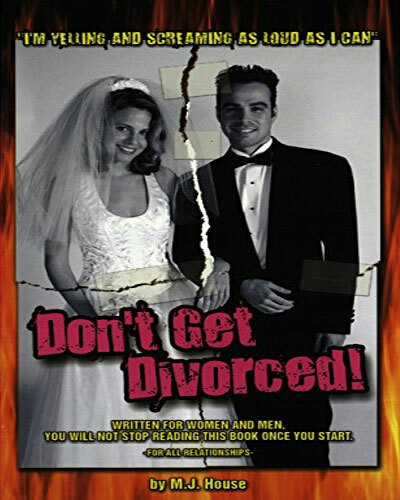 If you would like to purchase Don’t Get Divorced!, simply click on the BUY NOW buttons below to purchase through AMAZON, iTUNES or BARNES & NOBLE. Customers inside of the United States can expect their book within seven business days of receiving payment; and those outside the United States can expect their book within 14 business days of receiving payment.